Relating to license tags and plates; to provide for the issuance of a removable windshield placard to certain recipients of certain military honors or who are recognized as having a certain veteran status; to provide that it is unlawful to park in certain parking spaces designated for recipients of a certain military honor or for individuals with a specific veteran status under certain conditions; to provide for an affirmative defense; to provide for criminal penalties; and in connection therewith would have as its purpose or effect the requirement of a new or increased expenditure of local funds within the meaning of Amendment 621 of the Constitution of Alabama of 1901, now appearing as Section 111.05 of the Official Recompilation of the Constitution of Alabama of 1901, as amended. (a) Any person who submits to the Department of Veterans Affairs an application which includes satisfactory proof that he or she is a recipient of the Medal of Honor, the Purple Heart Medal, the Army Distinguished Service Cross, the Navy Cross, the Air Force Cross, the Silver Star, or the Bronze Star, or satisfactory proof that he or she was a duly recognized former prisoner of war, shall be issued a removable windshield placard displaying the appropriate military honor or veteran status. The application shall be on a form approved by the Department of Veterans Affairs. There shall be no fee for the removable windshield placard. (b) The removable windshield placard shall be prepared by the Department of Veterans Affairs in cooperation with the Department of Revenue. (c) The removable windshield placard shall be designed to hang from the front windshield rearview mirror when the vehicle is parked in a parking space reserved for persons with the corresponding military honor or veteran status. If the vehicle lacks a rearview mirror, the placard shall be placed on the dashboard. (d) The Commissioner of the Department of Veterans Affairs may adopt rules necessary to implement and administer this act. (a) It shall be unlawful for any person to park a motor vehicle in a parking place at any place of public accommodation that is designated for an individual who has received a specific military honor or for an individual with a specific veteran status who does not have the corresponding distinctive license plate as provided in Section 32-6-250, Code of Alabama 1975, or the corresponding removable windshield placard as provided in Section 1. (b) A violation of this section results in a fine of twenty-five dollars ($25) for a first offense, fifty dollars ($50) for a second offense, and one hundred dollars ($100) for a third or subsequent offense. (c) It shall be an affirmative defense to a prosecution under this section if the defendant is in fact a recipient of the military honor or has the veteran status that was designated at the parking place at which the alleged violation occurred. (d) Any authorized municipal, county, or state law enforcement officer may enter upon private property to enforce this section. (e) This section may be enforced by any law enforcement officer who has successfully complied with the minimum standards for police officers as set forth in Section 36-21-46, Code of Alabama 1975, including, but not limited to, municipal law enforcement officers, sheriffs, deputy sheriffs, and Alabama State Troopers. (f)(1) If the law enforcement officer who issues the parking violation under this section is employed by a local law enforcement agency, 50 percent of the fine collected under this section shall be paid to the municipal or county general fund for the use of the law enforcement agency by which the arresting officer is employed. The remainder shall be remitted to the State Treasury, to be deposited in a separate fund, to be distributed as follows: a. Fifty percent to the Administrative Office of Courts. b. Fifty percent to the Department of Veterans Affairs. (2) If the law enforcement officer who issues the parking violation is employed by a state law enforcement agency, the fine collected under this section shall be remitted to the State Treasury, to be deposited in a separate fund and distributed as follows: a. Fifty percent to the law enforcement agency of the arresting officer. b. Twenty-five percent to the Administrative Office of Courts. c. Twenty-five percent to the Department of Veterans Affairs. 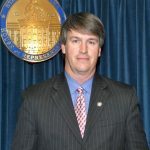 (3) All funds remitted to the State Treasury and deposited into a separate fund under this subsection shall be budgeted and allotted in accordance with Sections 41-4-80 through 41-4-96 and Sections 41-19-1 through 41-19-12, Code of Alabama 1975. February 20, 2018 H Assigned Act No. 2018-133. February 20, 2018 H Delivered to Governor at 2:47 p.m. on February 20, 2018.